Recently on Facebook, Crain’s Chicago Business residential real estate reporter Dennis Rodkin teased about something he was working on, showing a mysterious photograph of an “attic” somewhere that would reveal something interesting. We now know that the mystery space is the original, complex roofline of Joseph Brennemann Elementary School in the Uptown neighborhood of Chicago. 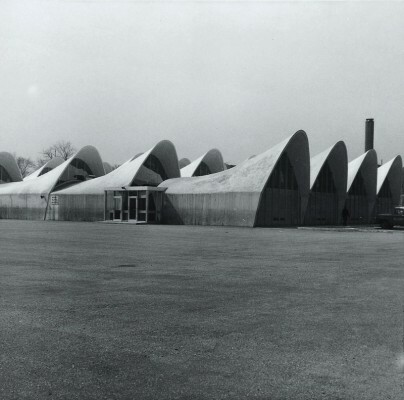 As with many of Goldberg’s designs, concrete was used not only structurally, but to make the structure beautiful and, in this case to serve another purpose: The parabaloid concrete shells each had a flat side with windows, allowing the classrooms inside the school to be packed together away from the exterior walls and still each have abundant natural light (and ventilation). It’s a clever and mesmerizing design that, unfortunately, met with complaints regarding leaking. Rather than tear the concrete structures down, the school board simply covered the entire top part of the building with a corrugated metal structure. Learn more about this fascinating bit of architectural history by following the link to WBEZ’s website here.